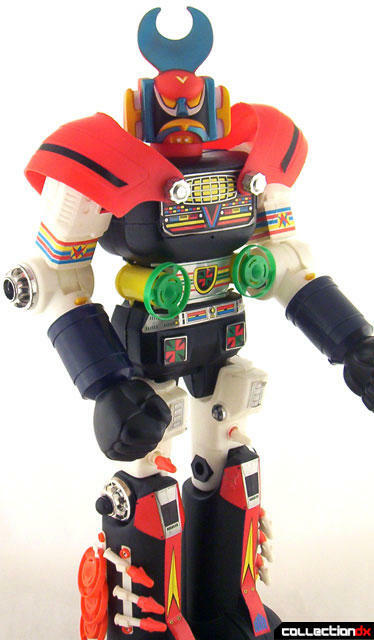 I admit, I have a bit of a soft spot for Space Valour because it's one of the very first Jumbos I ever got when I started collecting, right after all the Unifive Jumbo Machines and some Shogun Warriors. I suspect I'm not the only one that this was the scenario for since this one is often on Ebay at a relatively cheap $100. It's far and away the most common full size Jumbo bootleg so it's often a quick way for the new collector to add something to their lineup. But is it a good toy? Well, not really. Most bootleg Jumbos are pretty poor quality and these Robot Factory style ones that were released in Italy are often among the worst. Because there are so many pieces, many of which were taken from molds that were never intended to be combined with other pieces, they often don't line up very well. 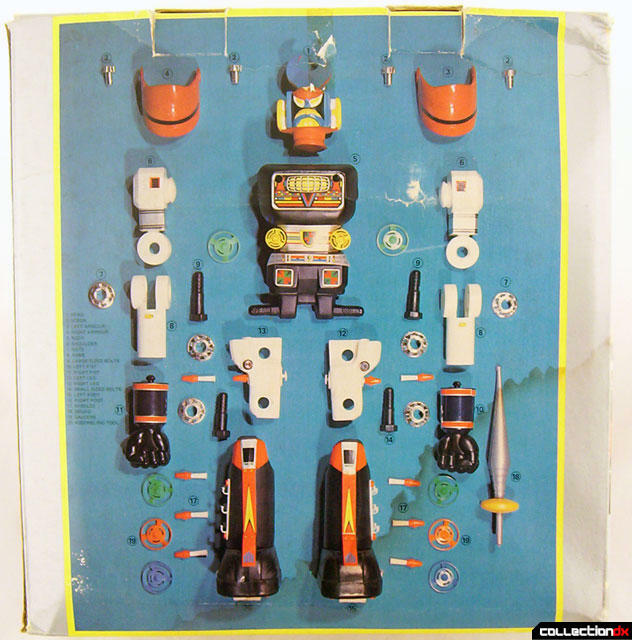 When an original Popy Robot Factory Jumbo is put together, it feels like one solid piece. Not so with Space Valour. Everything stays together, but nothing seems to "fit", if you know what I mean. If any of you have a dad who isn't a carpenter, but likes to imagine he is, then you know what I'm talking about. That homemade bookcase he made looks like a bookcase and it does hold books, but owning it only makes you want to get a real bookcase. That's Space Valour. The arms and legs both feel floppy. The plastic is not high quality and tends to crack, especially the clips that hold the missiles on the legs and sometimes the clip that holds the firing fists in place. This can cause the fists to shoot off themselves and they can be a pain in the neck to load, too. With that said, the makers of this toy were at least ambitious. They loaded it up with tons of firepower. Almost too much. Both fists can shoot, it shoots two spinning discs from launchers in the midsection and the legs also have missiles launchers. All the missiles and discs can be stored on the sides of the legs, which makes the toy look even more heavily armed. A sword rounds out the weaponry. On top of that, they actually sculpted an original head for this toy. 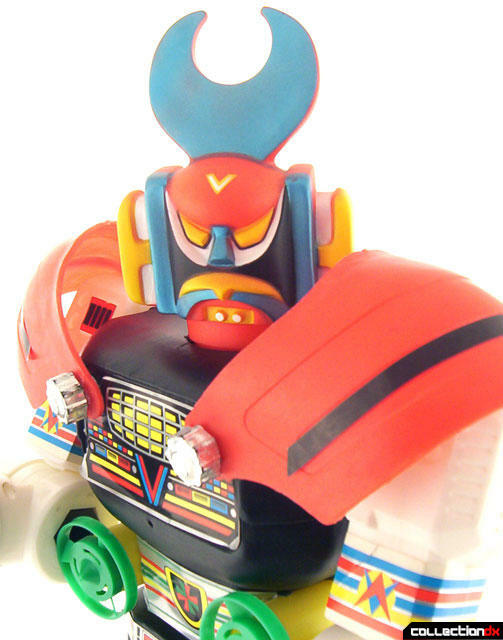 Most of the other Italy Jumbos, and most of this toy, are cast right off of existing molds, but Space Valour has his own unique look. Not only is the mold original, it's even an original design. No other robot has the same head as Space Valour. Ok, so now you may be wondering where the rest of Space Valour originates. 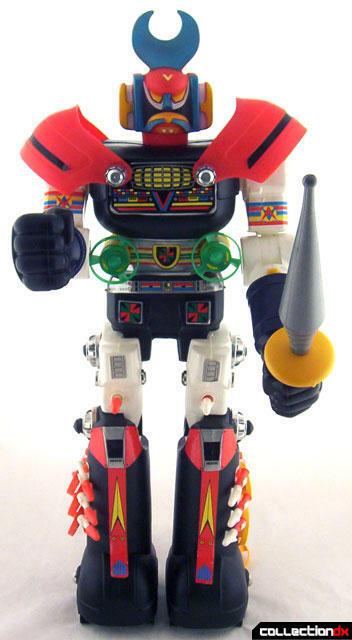 Well, you probably recognize the main torso from Daimos, even though it's been modified to hold those disc launchers and the shoulder shields. Speaking of which, both them and the legs come from Battle Fever Robo, but four small wheels have been added on the bottom. The arms are from Leopardon and the fists...well, I just noticed the fists seem to be unique, too. Although they are very similar to the fists from Battle Fever, Daltanious and GodSigma, they are in fact different. The circular "layer" nearest to the elbows is actually raised up, whereas it's lower on the others. Interesting. 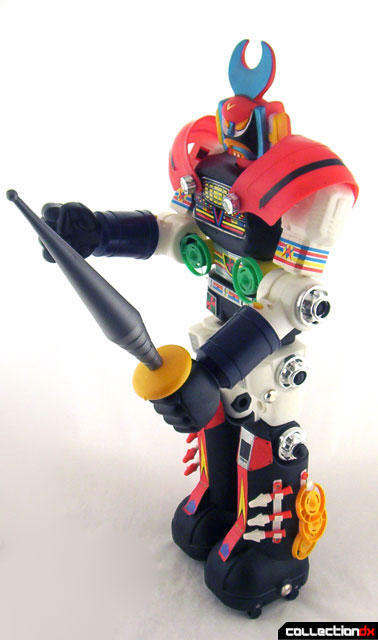 Anyway, back to the rundown, the sword is from the Takatoku "Daikengo" Jumbo and although I'm not sure if it's the exact same mechanism, the "Super Jumbo Jeeg" from Takara utilizes the disc launching gimmick. It wouldn't surprise me if it's from there considering the popularity of Jeeg in Italy. The missiles look very much like the missiles from the Nakajima line of Jumbos, but are a different size and usually not interchangeable. Of course, there's always slight variations on these things so your experience may be different, but I wouldn't count on it. Lastly, you can see nods to both Dangard Ace and Daltanious among the sticker designs. Oh, speaking of the stickers, you'll notice that mine is missing the stripes that go around the forearms. Back to variations for a second here. 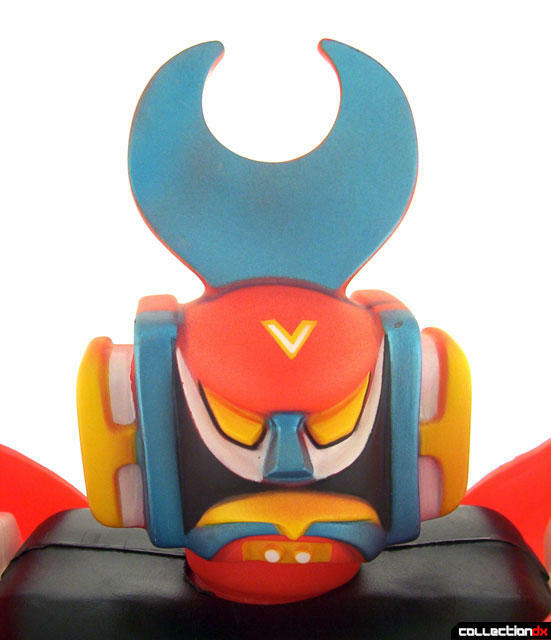 Although this toy is most often called "Space Valour", you might find it from time to time in other boxes. The second most common one is called "Zork", but there is a third. I can't remember the name of it right now since I've only seen it once and apparently forgot to save the picture. But I think it's something like "Warrior Of Space" in Italian or something like that. I'll try to find out. All three boxes feature similar artwork on the front. 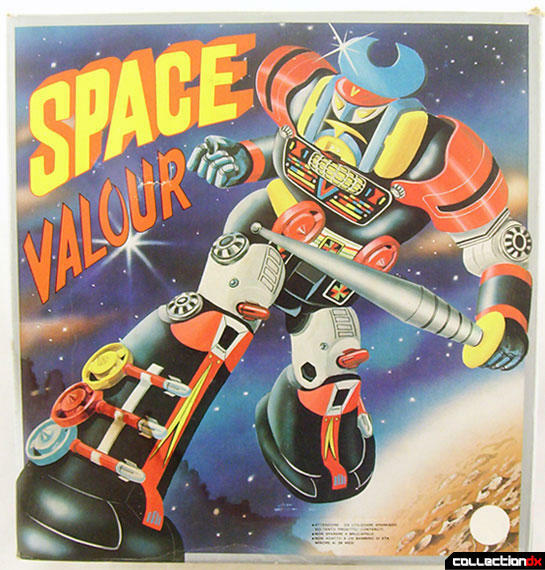 So, basically, if you're looking for a quality toy, you can give Space Valour a pass. If you're just looking for a cheap jumbo to tide you over until something more appealing comes along, it might be a good option for you. Just know what you're getting into ahead of time and don't expect too much. I personally am very fond of mine. It looks GREAT on the jumbo shelf and it actually functions very well. I don't think it is as bad as your review describes. Considering the robot can be dismantled and built again, compared to standard jumbos is sort of neat. All of my missiles, fists, and disks perform just fine. If you find one new in the box like I did- GRAB IT. I think you will like it for what it is. Sure it is not Popy, but it does not cost $2,500 either!!! Well, like I said, I do like the toy, but for people only accustomed to Popy or Mattel jumbos, or even no jumbos at all, I think it's best to lower expectations with this guy. Thanks for bumping this and reminding me to try to find out that box variation again though. Well, it took long enough but I finally found out the alternate name for this guy. It's "UFO Il Gigante dello Spazio". personally i think bootlegs are more interesting than official toys. there's a lot more mystery and more of a story behind each toy. i'd love to read about the source of these bootlegs and whether or not they were actually profitable.